This week is fairly quiet, but we have a couple announcements. First up: if you love this blog and find it helpful, consider showing your support! 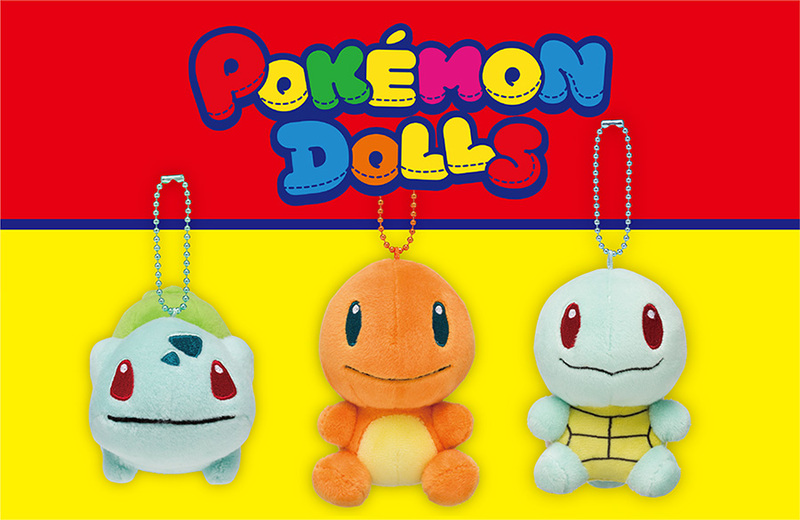 Pokedolls return in smaller, mascot plush form, to Pokemon Centers and Stores in Japan on September 15th (Saturday). Each mascot plush will cost 1,058 yen including tax. A new series of smaller sized finger puppets, similar to the Pokemon Kids line, will start selling exclusively through Pokemon Centers & Stores on September 15th (Saturday). 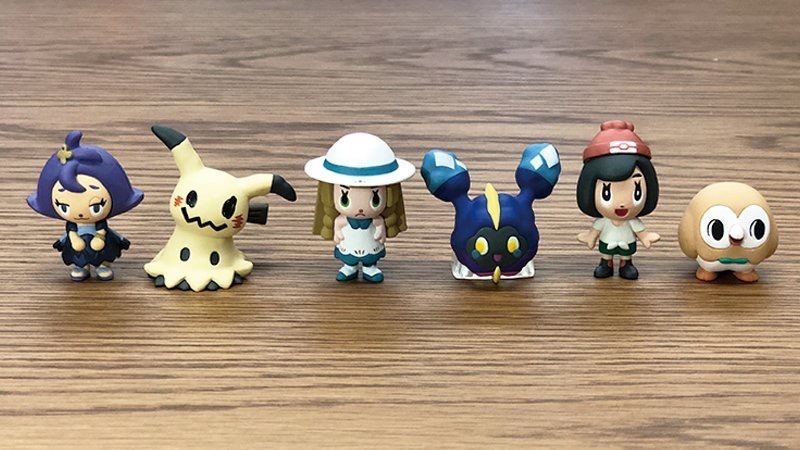 This first batch of figures have a Kanto theme and will include: Pikachu, Eevee, Vulpix, Slowpoke, Magnemite, Gengar, Magikarp, Ditto, Snorlax, and a tiny Pokemon Center. Each figure will cost 300 yen including tax. Last but not least, from Takara Tomy, a new set of Chokkori-san plush are scheduled for release around October 25th. 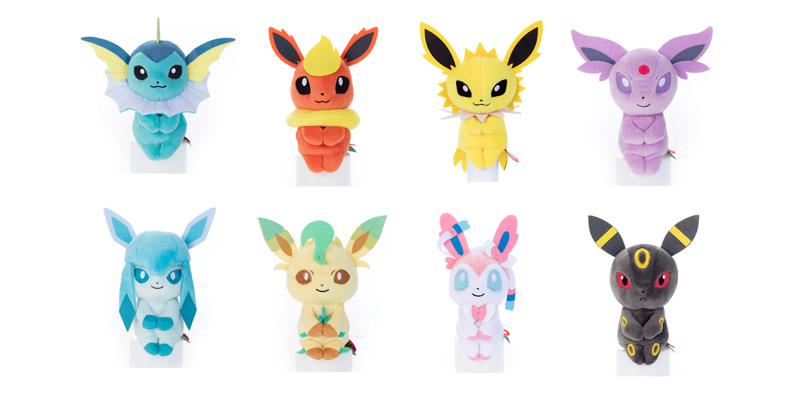 This set will feature all of the Eeveelutions excluding Eevee which was already released. Each plush will cost 1.296 yen including tax. 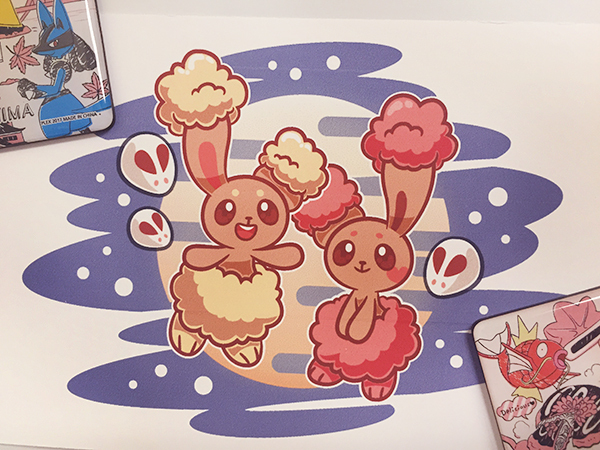 It’s the end of August so let’s talk about the Pokemon prizes coming out for September! Some of the bigger name game centers in Japan include: Adores, Sega, Round 1, Namco, and Taito Station. Not all game center locations stock all prizes. If you’re having trouble finding stock of the item you’re looking for, feel free to send me a message! A new series, “I Love Snorlax”, starts in September with two releases. Unsurprisingly, this series is all about Snorlax. A large plush Snorlax face cushion (measuring about 38 cm) will start appearing in game centers from September 5th (Wednesday). A plush Snorlax tote-bag (measuring about 30 cm including the handles) will start appearing in game centers from September 13th (Thursday). From the popular Korotto Manmaru series, a set of large plush (measuring roughly 25 cm each) including Charizard, Pidgey, and Farfetch’d, will start appearing in game centers from September 26th (Wednesday). The relatively new “Pokemon Tsuretette” series will have two releases, both of which will start appearing in game centers from September 20th (Thursday). 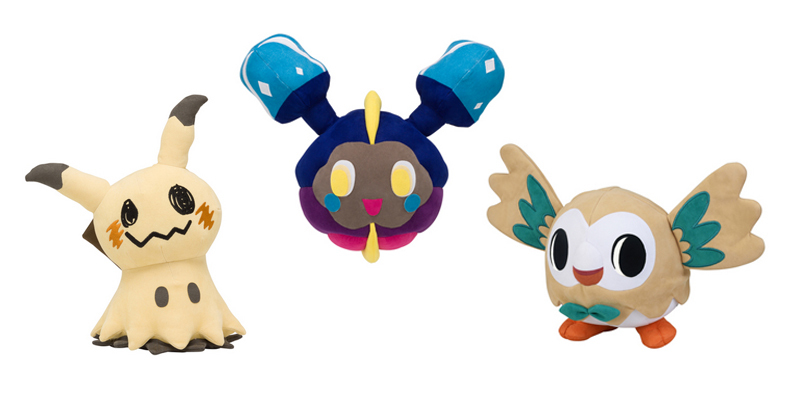 One release is for a set of smaller plush (each measuring about 12 cm) and includes Cleffa, Munchlax, and Pichu. The second release is for a set of larger plush (each measuring about 24 cm) and includes Jigglypuff and Togepi. Last but not least – from the generic Pokemon Sun & Moon series, we get two extra large plush! Mimikyu (measuring about 28 cm) will start appearing in game centers from September 5th (Wednesday). Dragonite (measuring about 38 cm) will start appearing in game centers from September 26th (Wednesday). That wraps up this month’s Banpresto overview post! This past weekend (August 25th) gave us two big releases: Pokemon Time (coming soon!) and Pokemon Center exclusive plush for every single starter Pokemon across all 7 generations. This release was in conjunction with the apparently year-long celebration of the Pokemon Center’s 20th Anniversary in Japan. 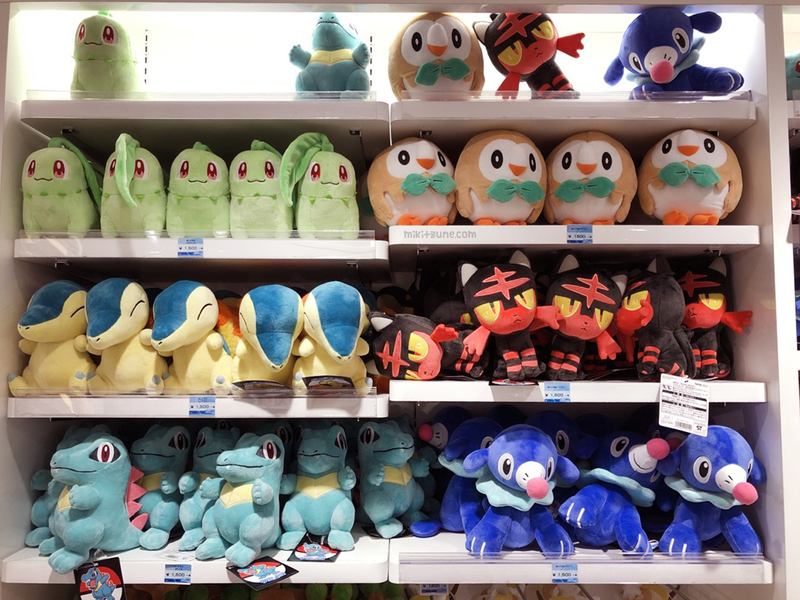 The majority of these plush are new releases with a new pattern although the following were all re-releases: Chikorita, Totodile, Cyndaquil, Piplup, Rowlet, Popplio, and Litten. As mentioned previously, the Halloween promotion will drop September 8th (Saturday) at all Pokemon Centers and Stores in Japan. This year’s promotion doesn’t have quite as extensive a selection as past years however on the other hand we have 6 plush and 4 mascot plush, which is a lot for a Pokemon Center promotion. 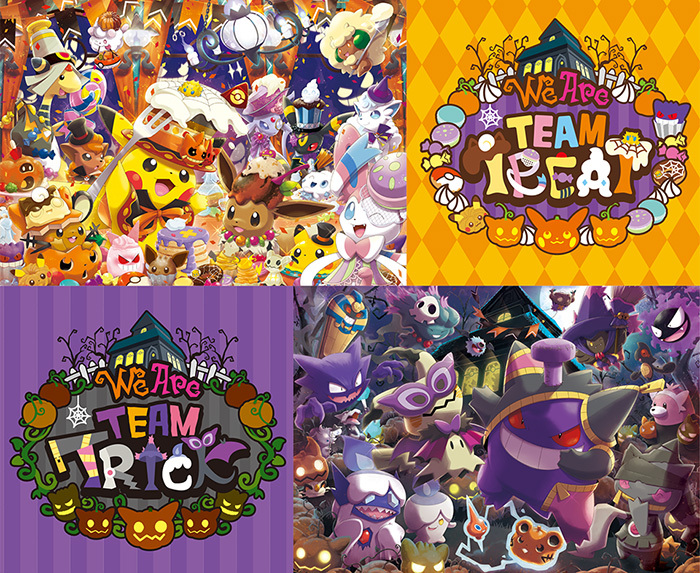 The Halloween promotion is divided into two parts: Team Treat (with Pikachu) and Team Trick (with Mimikyu). The three main plush for Team Treat are Pikachu, Ampharos, and Sylveon. The three main plush for Team Trick are Mimikyu, Pumpkaboo, and Gengar. Each plush will cost 1,944 yen including tax. The two mascot plush for Team Treat are Umbreon and Dedenne. The two mascot plush for Team Trick are Banette and Sableye. Each mascot plush will cost 1,296 yen including tax. 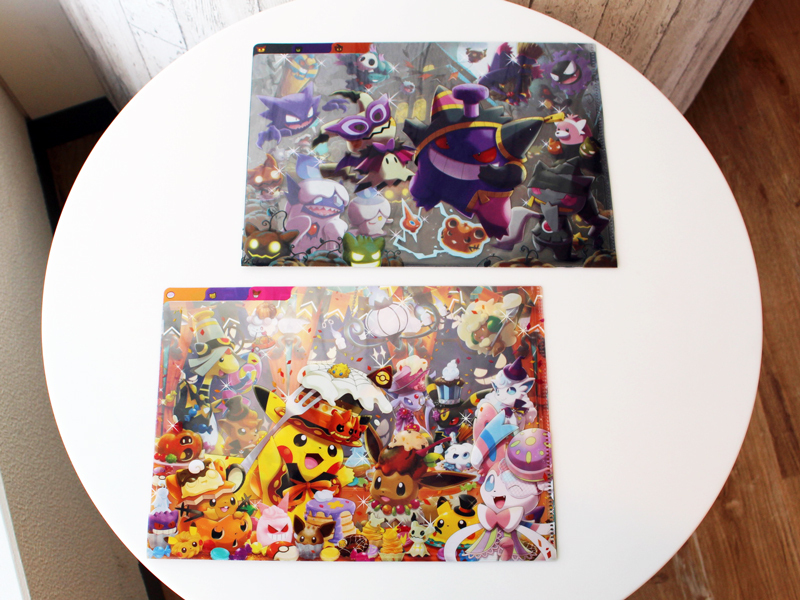 Along with the plush, there will also be two sets of A4 size clearfiles, with 3 designs per set (410 yen including tax per set). Each tin comes with print cookies – cookies with Pokemon printed on them. 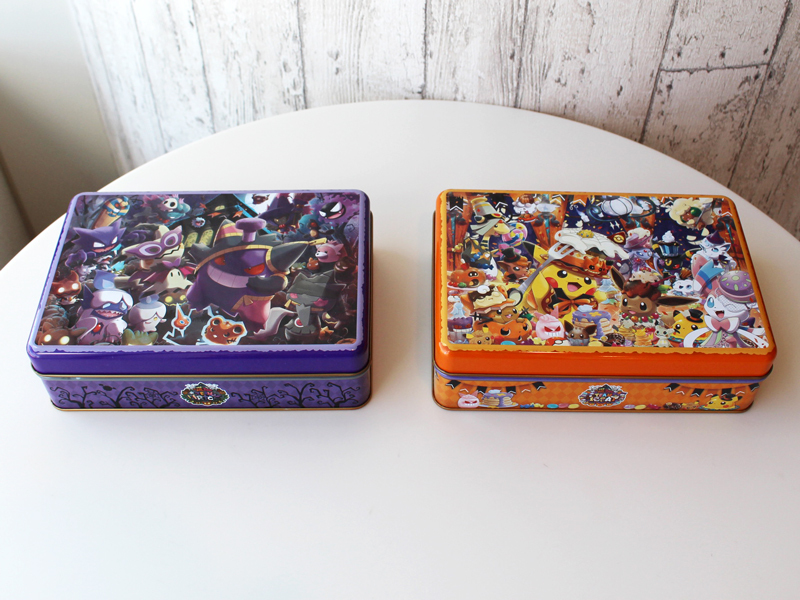 As probably assumed, the Team Trick cookie tin will have cookies featuring Team Trick Pokemon, and same for Team Treat. There will be two types of blind packaged charms – each will cost 540 yen including tax for a single charm. The final photos for the Pokemon Time Vol 11 release coming out tomorrow (Saturday August 25th) surfaced so better late than never! 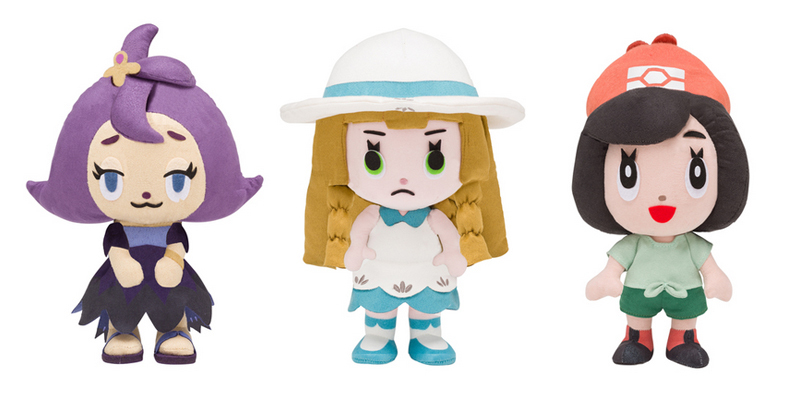 First up: three surprise plush! For the first time in Pokemon Time history, the Pokemon Center is selling human plush. Pre-orders for Acerola, Lillie, and Moon will start August 25th (Saturday) at 10 am and close September 30th (Sunday) at 11:59 pm JP time. Plush are scheduled to ship out January 2019. Each plush costs 4,104 yen with tax. Along with plush, the three trainers will join their companion Pokemon (Cosmog, Rowlet, and Mimikyu) for the Pokemon Time gacha, making two more firsts for the Pokemon Time series. As I sort of expected, the three main Pokemon Time plush look pretty much the same as their mascot plush counter parts… simply bigger. 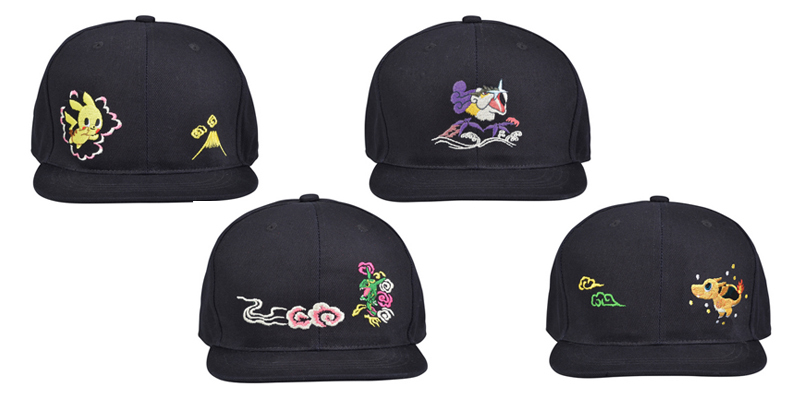 We also finally can see the very original skajan inspired hats from the skajan portion of the Pokemon Time release! That wraps up this week’s Pokemon Center announcements. All items mentioned in this post can be pre-ordered through Japanstuffs.com so check them out if you’re interested! Welcome to another catch-up Pokemon Center report post. 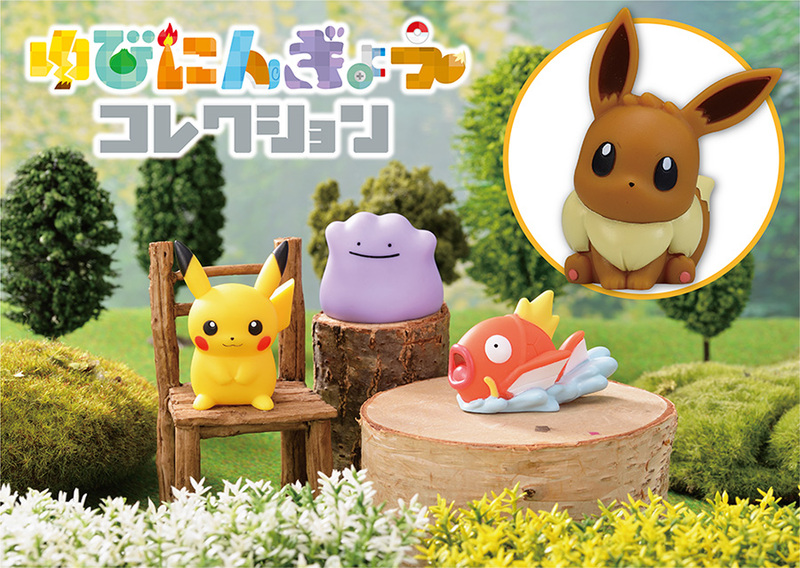 The super cute Pikachu & Eevee 7 Days Story promotion went on sale July 21st (Saturday). Although there weren’t any plush in the line-up, there were still plenty of cute things! The main highlight were 7 matching Pikachu & Eevee pins, with 14 designs in total. The pins were each sold separately, however the Pokemon Center offered a deal where if you bought 1 Pikachu and 1 Eevee they gave you a small discount. Cute necklaces! One for Pikachu and one for Eevee. Cute hair ties! There were two designs each for Pikachu and Eevee: one round or oval version and one bow shaped version. 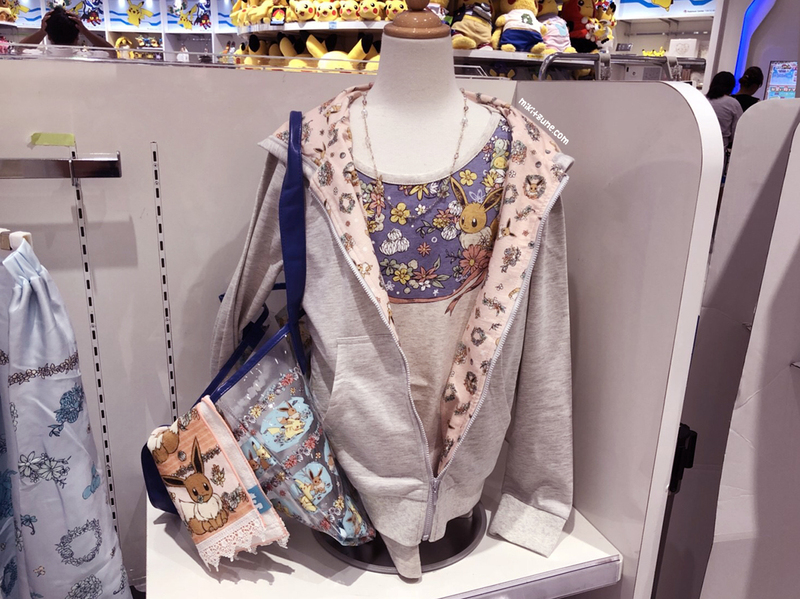 This promotion had a bunch of cute clothing items and bags (including the Eevee shirt and hoodie pictured above). The skirt ended up being surprisingly popular as it was one of the first items to sell out. We’ll close up today’s post with a couple random pictures from the newly opened Pokemon Center in Nihonbashi and Mega Tokyo! 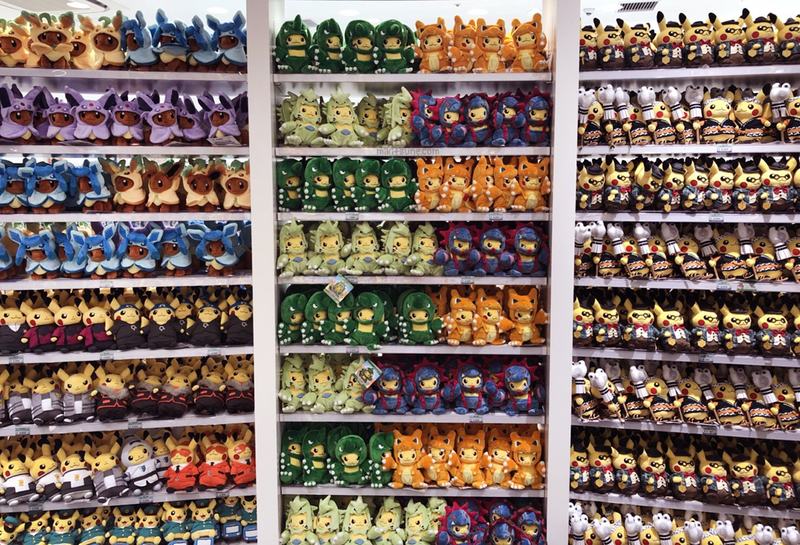 Walls and walls of cute Pokemon plush – is this heaven? 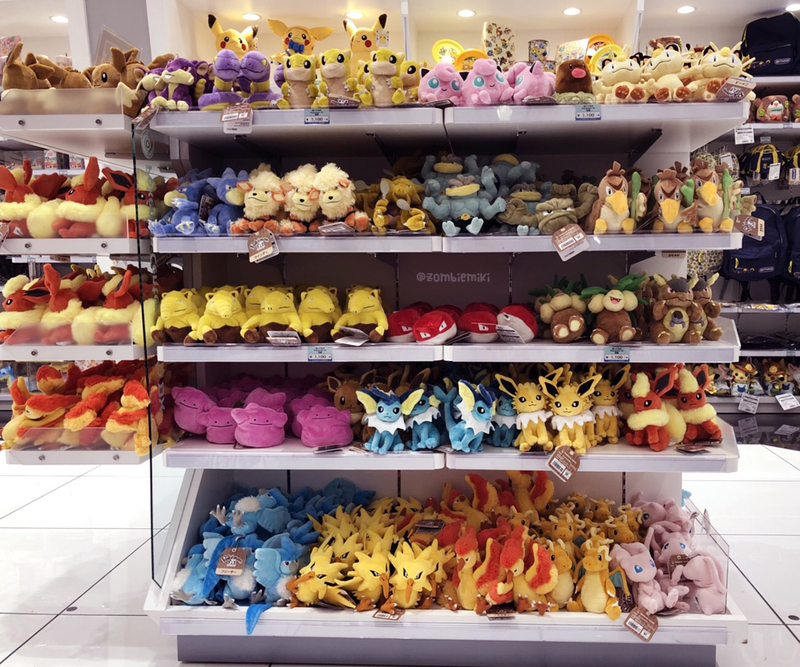 Display of some of the plush from the previously released Pokemon Fit series. Larger sized Pokemon Center exclusive plush from the Johto and Alola regions. Cute tote-bags featuring Pikachu and Eevee as part of the 2018 Pokemon summer movie promotional merch. 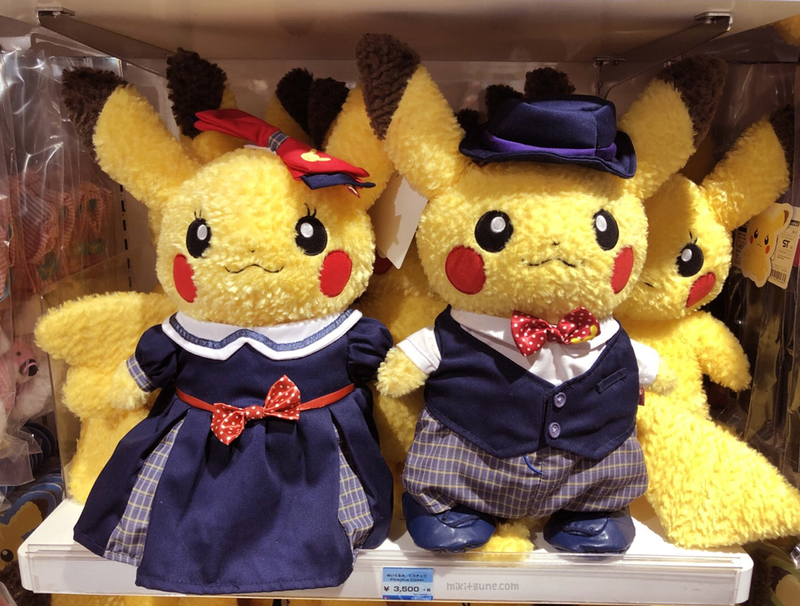 An adorable pair of Pikachus, dressed in their Sunday best!